Rule#1: The bigger the area and population of an area = The harder it will be to rank for that area. ‘Real Estate’: 1,250,000,000, Over ONE BILLION Results! Do you think you can get on the first few pages of that search: Yes, it would take years or many $$$ to rank for that term. ‘California Real Estate’: This result is 115,000,000, One Hundred-Fifteen MILLION, one tenth the result as above, but still a difficult task to rank. ‘Thousand Oaks Real Estate’: 1,010,000. Down to One Million Results. Much less competition but still going to take time and money to get there, but it is doable. Thousand Oaks has over 130,000 inhabitants, and yes, size of area and population does matter on how difficult it takes to rank highly on Google. ‘Mountclef Village Thousand Oaks CA’: Just 12,400 Results! You can win! Now we have a strong chance to rank. Think you could rank highly for this area? Absolutely! Now let’s see how and why! You can win this one! Look at the image. Notice it is a defined area or “Virtual Farm”. Step 1. Pick a Local Area of at least 2,500-7,500 homes. This is like creating a ‘Virtual Farm Area’ (VFA) for your website. It will rank high for that area and generate business for you over time. Step 2. Create a custom page for your new “Virtual Farm” on your website. If there is a neighborhood sign or recognizable image, take a picture of it and add it to the top of the page. Add a Custom IDX MLS search on that page to display all the current listings and sold listings for that area. Create it using a Polygon Search Tool for the best results. 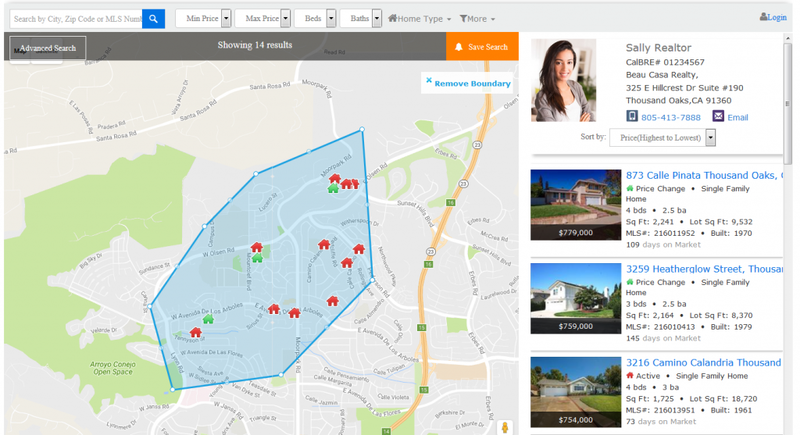 Display the homes with the live MLS data on that page, like our Featured Slider or Featured Grid does, or use a Search Results page like this. Add information about the area from your own knowledge, Wikipedia or a search on Google. Be sure to rewrite any information you find in your own words and do not plagiarize. Add SEO Meta Tags, Descriptions, Alt Tags on images, etc. to increase the attractiveness of your new custom marketing page on Google. Step 3. Market and/or Advertise your page. Blog about the new area you specialize in. Post on Facebook any new activity there, listings, sales, your involvement. Become the expert in your new area. BONUS Step 4. Actually Farm the Area Old School. Hand out flyers and updates of the area market. Then become the top listing agent in all of South New Jersey! Oh, that was me, but you can go forth and rock your own world. The Mountclef Village, Thousand Oaks, CA area yielded 12,400 results. This is a very winnable battle for you. There about 3,500 to 4,500 homes I estimate in that area/neighborhood. Average price is $749, 000 and there are currently over 25 homes on the market. If they all sold the gross commission for one side of the transaction (5% overall commission), would be $468,125 in commissions, if you had a side in each of the sales. Of course, you won’t get all the sales, but over time you can build to be the key player in that area. The kicker is that is for ONE neighborhood and you can build as many custom marketing programs as you want for your website(s). Most of our actively marketing Clients (both self-marketing or having RealtyTech market for them), have between three and five custom neighborhood marketing programs. Another bonus of doing this is that over time, not only will you rank well for your Virtual Farms, you will also start showing up for other larger areas over time, if you do your SEO correctly. Please give me feedback on this post. Was it too difficult to follow? Would you consider committing to an area like this? Want more on this topic? There are some next steps to take this to the next level.